If you have ever wondered how orthotics can correct knee or hip problems then read on. Consider the last time you had a cut or a sore like a blister on the bottom of your foot. Most likely, you attempted to walk in a way that reduced the pain. By avoiding placing pressure on the sore point, you change the angle of your foot when you walk and the next thing you know, your knee or hip hurts because you are walking differently. Alternatively, you may experience pain in the back or hip, and when you alter the way you walk to compensate, your feet to begin to hurt. It is really very common. There are many reasons for aches in the back, legs, and feet. Some of these include – accidental trauma, poor posture and gait, overuse injuries, poorly fitting shoes, or simply signs of age. That is why people whose feet or legs are not “biomechanically correct” or in perfect alignment, often experience pain in other parts of their body. We call this the foundation principle, and we are only as strong as our foundation. Footmaxx Orthotics correct the movement and function of the foot, restoring a stable foundation which helps to relieve problems of the knees, legs, hips and back. There is a secret to making orthotics that give you exactly the right correction. The Footmaxx Gait and Pressure Analysis computer accurately measures the distribution of force throughout your foot during each step, identifying high-pressure areas and gait abnormalities. In the past, doctors relied on plaster or foam casts to get an impression of the feet. Unfortunately, these casts record only the shape of the foot at rest. When a plaster cast is made, the foot is in a static, non weight bearing position. People develop foot problems while moving and bearing their body weight, not sitting. Our system collects accurate measurements that are taken by a computer while your feet are in motion and weight bearing. It just makes more sense to do it this way and it is easily completed in just a few minutes. This often results in pain or discomfort in the feet, ankles, knees, hips or back. And yet most of us simply choose to ignore the pain. Many people think they have to live with it, or hope it will just go away. Why do people have problems with their feet? It is simple! Your foot is always in motion and under enormous pressure from the weight of your body. As we walk or run, our entire weight lands on our feet, up to 7,000 times a day. Now you can appreciate how that little blister can lead to an aching back! Doctors and scientists know that with the proper support, most problems with feet, and in many cases, legs and lower back, can be corrected. If you are experiencing any type of discomfort with your feet, or if you would just like to check out how well your feet are performing, we invite you to discuss your concerns with Dr Mauger. 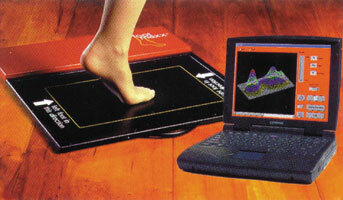 Your scan will reveal exactly how your feet are functioning and also help to identify the cause of your problem. It is also possible to identify and prevent the development of foot problems if early correction is made. The moral of this – get it checked even if it does not hurt.­..yet. We have helped many, many people as have other practitioners using this same system throughout the world. In fact, we are so confident that we can help you too, we provide a NO RISK, 45 day money back guarantee! FREE COMPUTERISED FOOT SCAN ! No obligation. Please mention this offer when making your appointment.